Nowhere Place Opens June 22nd. 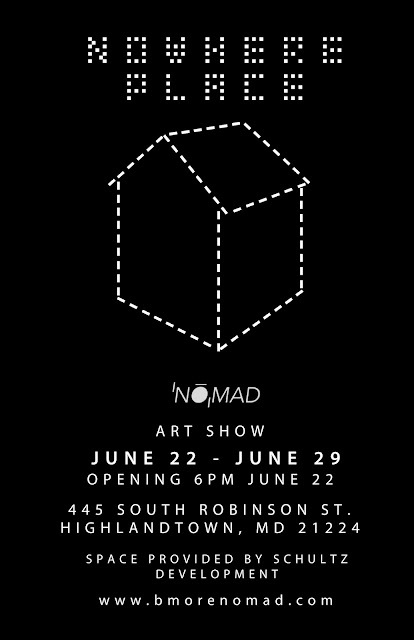 The Nomad Gallery in Conjunction with Schulz Development will be opening a new Pop up exhibit to open this Friday June 22nd at 6pm. The Nomad Gallery Projects makes public gallery, exhibition and art retail spaces from once empty store fronts. Nomad Gallery packs up and moves to new locations all over the Baltimore city area. The Goal of Nomad is to promote the emerging artist and to take empty store fronts and fill them with innovative beauty. Through the partnership of artist and building owners we create a low budget DIY space that hosts art of all mediums and reaches people all over the city. The Goal of Nomad is to promote the emerging artist and to take empty store fronts and fill them with innovative beauty. Through the partnership of artist and building owners we create a low budget DIY space that hosts art of all mediums and reaches people all over the city. Success to us would be the promotion of struggling artists, the public finding inspiration and happiness from the exhibition and our sponsors getting more exposure. Schultz Development is a local development company that specializes in rehabbing residential houses. Their target area is East Baltimore, specifically Highlandtown, Canton, and Brewers Hill. The scope of their work extends beyond simply building houses; they care about seeing communities grow and flourish. The Culmination of shultz’s vision is to see Eastern Avenue. bustling with street life and creative businesses. They are excited to work with the Nomad Gallery to help bring a creative energy to the street. By using a currently unoccupied storefront, The Nomad will become an extension of Schultz’s vision by bringing energy to the Avenue. In turn, this allows Highlandtown to participate in expressing The Nomads vision of the city. The possibilities that can arise from this collaboration are endless and both groups look forward to seeing the positive impact this will have on the neighborhood.